I don't deviate from the "movies and TV" theme of the Soap Box Office very often. But on rare occasions, sports takes priority and since this is my only medium at the moment, I must commandere this space for a moment. We'll be back to our regularly scheduled (and completely irrelevant) movie ramblings tomorrow. The Texas Rangers have just completed a historic playoff series victory. 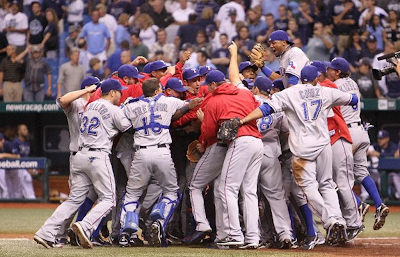 The TEXAS RANGERS won a playoff series. I have to keep repeating that to myself because it doesn’t feel real. I’m a little worried that this is some giant episode of “Punk’d” with the Universe playing the role of Ashton Kutcher. Like I’m going to wake up in the morning and the Sportscenter anchors will be laughing at the brilliant joke they’ve just pulled on us all. Linda Cohn will point into the camera and scream, “HA! Like you could EVER win a playoff series! You fools!” And I’ll just slump my shoulders and nod my head and know it to be true just like Luke Skywalker knew Darth Vader was telling the truth on that platform in Cloud City. (Anytime I can combine sports with “Star Wars” you know I’m doing it.) The last twenty years of Ranger baseball has conditioned me to expect utter failure and to be happy when the team wins enough to keep me interested until football season starts. So to win three playoff games (and all three on the road no less) seems almost out of the realm of possibilities. It’s not easy to write a celebratory sports column in a moment like this. We haven’t won the World Series or anything like that and in fact, this is a pretty insignificant victory in the grand scheme of baseball things. The truth of the matter is Yankee fans don’t even know what it’s like to celebrate a Division Series victory. That’s just a small stepping stone on the path to another bought and paid for championship. But writing is what I do and when my team makes franchise history…come on, what the heck else am I supposed to do? I’m certainly not going to go to sleep anytime soon. So I’ll focus on a couple of small moments and hope I get a chance to write another victorious blog post in a couple of weeks. There are four moments that really stuck out to me tonight that might have gone unnoticed. Molina, the Ranger catcher known first for calling a great game behind the plate and second for being slower than a one legged tree sloth, led off the top of the third with a line-drive single. A couple batters later manager Ron Washington called for a hit-and-run on a 3-2 count. Batter Elvis Andrus swung and missed but the call caught the Rays so off guard that Molina managed to truck into second for a stolen base. This is the moment when I knew we were going to win. I didn’t voice this thought so as to keep from incurring the wrath of the sports gods but in my mind, I KNEW we had the win. If Bengie Freaking Molina is stealing bases, then you know you can do no wrong. In the bottom of the third, Cliff Lee gave up a couple of weak hits that resulted in a run for the Rays. He had looked uncharacteristically erratic through three and he stepped up to face Carlos Pena to start the fourth inning. Pena crushed the Rangers in the last two games and I hate him for this. It’s not enough that he was a first round pick for the Rangers in the late 90’s and did ABSOLUTELY NOTHING the entire time he was in the organization. No, now he has to kill us in the postseason, too. Jerk. Lee works quickly, going low curve for a strike, high heat for a ball, inside fastball that was fouled off, and then ends it with a curveball that started at Pena’s shoulder and dropped beautifully into the zone. Lee had gone to the curveball a few times before that but this was the moment where I think everyone realized, “Crap, he’s got his stuff tonight.” After this pitch he routinely went back to the curve and worked it all over the plate, getting the Rays to swing at the balls in the dirt and watch the ones that hit the zone. In other words, he was unstoppable. Okay, obviously a two run blast in the top of the 9th that puts the game away didn’t go unnoticed. What might have slipped under the rug, however, is that suddenly and out of nowhere, Ian Kinsler is clutch. I have mercilessly bashed on Kinsler at every opportunity over the last couple of years. On a team that is chock full of likeable players, Kins is an easy target for negativity. He comes across as arrogant, he swings at 3-0 pitches when he shouldn’t, he commits stupid errors in the field, and he routinely chokes when it matters most. Somewhere in the last month, though, Kinsler has gone from the guy who foolishly tries to win the game with every swing to a valuable, big play hitter. He hit a game winning double in the last week of the season followed by his huge bombs here in the ALDS. All three of his homers in this series were big, clutch hits. I’m not sure what’s turned it around for him but when the team’s long-time clutch bat Michael Young is slowing down and MVP Josh Hamilton is obviously still struggling with injury, Kinsler’s sudden dose of clutch hitting is greatly appreciated. I take back 87% of the things I’ve said about the guy. Josh Hamilton’s history of drug and alcohol issues have been reported ad nauseum so I’m not going to delve into that here. Suffice it to say, the Hambone simply CANNOT be around alcohol. When the Rangers clinched the division a few weeks ago, Hamilton had to skip out on the champagne-soaked post-game celebration, opting instead to spend the evening in a church. Things were a little different this time around. When Hamilton entered the clubhouse tonight, the champagne and beer were replaced by ginger ale. The guys all piled into the room, goggles on, and doused each other in bubbly soda so that their teammate and on-field leader could be involved in the celebration. 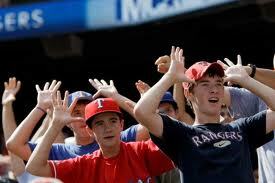 It was just one more example of how ridiculously tight the Ranger clubhouse has been all season. From the Claw and Antlers to the endless barrage of post-win shaving cream pies, the guys on this team have created a firm bond with each other. That’s the only reason they’ve been able to succeed against near-impossible odds given all of the hardships the franchise has gone through this year. It was a seriously touching moment that I picked up on immediately and choked me up a bit. I’m honestly a little ticked that so many other media outlets caught hold of the story and that I’m easily the 4 millionth reporter, journalist, or blogger to write about it. Of course there were a lot of other huge plays throughout this season, series, and game. (How in the world does Vlad score from second on an infield single?!) But these are the moments that stuck out to me as I paced the floor relentlessly and came close to nervous vomiting on numerous occasions. This is without question the biggest win in the history of the Ranger franchise but you get the feeling there are more wins to come. It’s time, yo. P.S. Lloyd was the head angel in “Angels in the Outfield” in case that reference was over your head.